I have two young daughters so my film watching and reviewing is limited to the couple of hours I have to myself after they’ve been put to bed. However, now and again I get the opportunity to cover a family film I can share with my girls. The Big Bad Fox and Other Tales was perfectly pitched towards them, particularly my eldest, who’s recently turned 5. So, for a change, I thought I’d get them to help me review it, as well as us watch it together. They didn’t have a great deal to say about the film (they’re very young), but I got a good idea of what they liked and will include it with my own thoughts below. 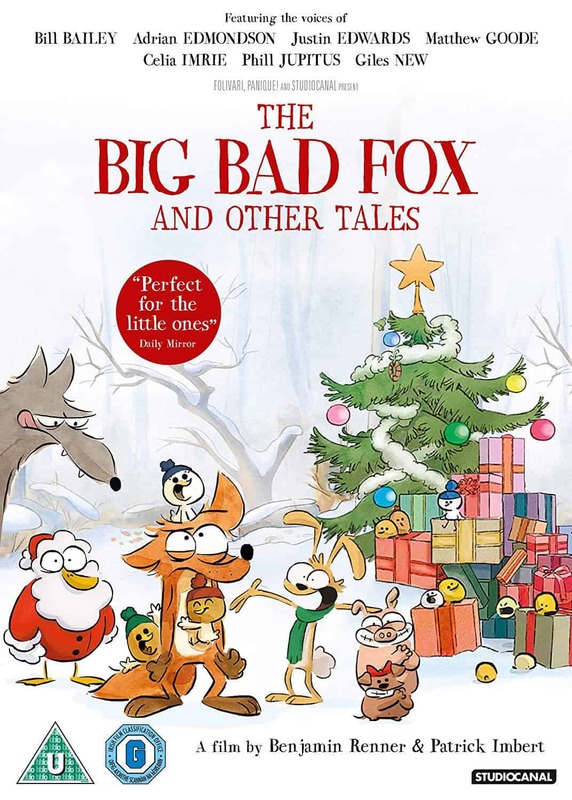 The Big Bad Fox and Other Tales is a French animated anthology film based on the comics by author Benjamin Renner. Renner directs too, alongside Patrick Imbert. There are three separate stories told within the film, all set in and around a small farm. Framing the stories, we have the titular fox (Guillaume Darnault or Giles New in the English dub) and friends presenting them as theatre shows. The first story, ‘Baby Delivery’, sees a stork (Christophe Lemoine) crash into a tree on the farm, leaving an uptight pig (Damien Witecka/Justin Edwards) and a careless rabbit (Kamel Abdessadok/Adrian Edmondson) and duck (Antoine Schoumsky/Bill Bailey) in charge of delivering a baby to its parents. 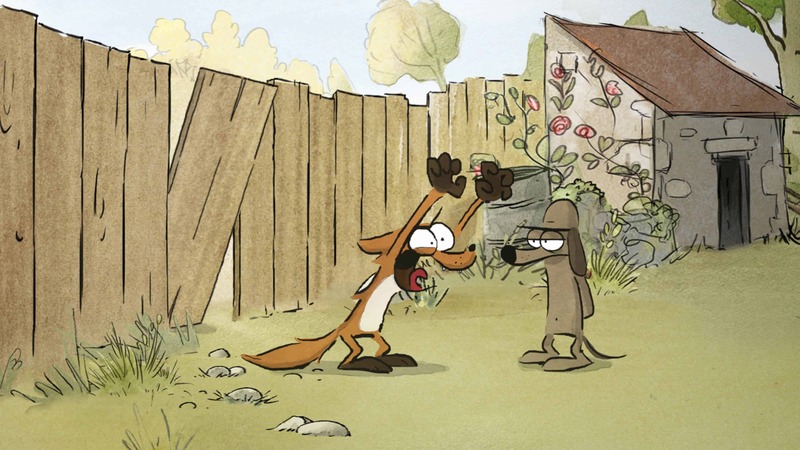 In the second story, ‘The Big Bad Fox’, fox turns to the scary wolf (Boris Rehlinger/Matthew Goode) for advice on how to be intimidating, so he can get some chicken to eat. Wolf convinces fox to steal some eggs and, after they’ve hatched, look after the birds for a couple of months until they’re big and they’ll eat them together. Fox grows attached to the youngsters though, so has to ward off wolf and get the clingy chicks (who think they’re foxes) back to their mother. The final story, ‘We Must Save Christmas’, begins with duck and rabbit accidentally ‘killing’ a decorative Father Christmas toy, after mistaking him for the real thing and attempting to save him from danger. Believing Christmas will be ruined, they decide to take on Santa’s duties and head off with pig and a make-shift sleigh to try and deliver toys to every good child on Earth. Things, of course, don’t go to plan. Children’s films seem to be overambitious these days, either crafting elaborate, often high-concept narratives or offering up meaty themes and gags designed to appeal to adults rather than the kids you might think are the intended audience. This isn’t always a bad thing. Pixar, in particular, has made some incredibly rich films over the years with a lot to say whilst remaining enjoyable for the whole family. Indeed, I’m an absolute sucker for animated kids films and will watch anything, regardless of its critical reception. Hell, I sat through Boss Baby with little complaint. However, I often find myself missing the simple pleasures of the cartoons I watched when I was a kid. As admirable as it is to teach children the rights and wrongs of the world whilst they watch TV, I grow tired of the endless moral lessons of the programming on CBeebies and talk the kids into sticking on a Looney Tunes DVD for some mindless silly fun. 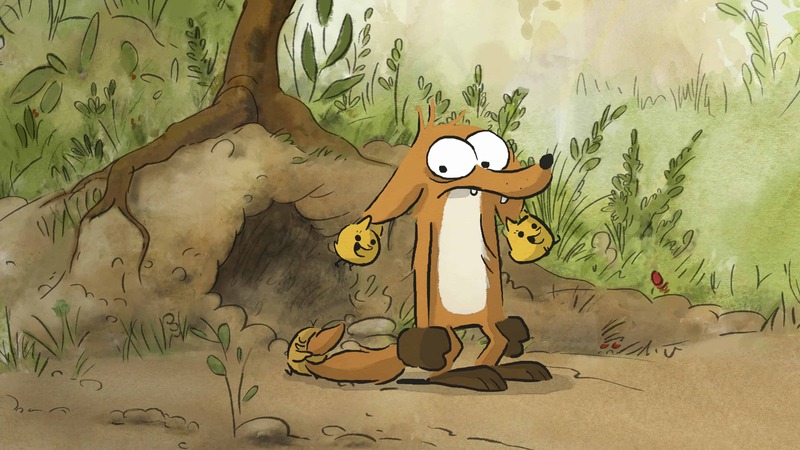 So I was pleasantly surprised when I watched The Big Bad Fox, finding the sort of innocently fun children’s film I felt the current generation was missing out on (although I’d add the wonderful Paddington films to this group). The Big Bad Fox isn’t doing anything new. The stories are all familiar and the jokes are largely classic visual gags and slapstick. However, it’s all done with great charm and no irony. There are maybe some lines here and there that adults will better appreciate, but the film never tries to play beyond its prime audience. In keeping things simple like this though, it actually ends up appealing to everyone. Indeed, I was laughing along with my kids at some of the daft exploits of our farmyard protagonists. The characters, although widely drawn, are all lovable. My girls particularly liked the silly rabbit and duck double act. The English voice cast are very good too, delivering the jokes with effective comic timing. I’d usually go for the original language, but with the girls watching and unable to read subtitles, I had to opt for the English dub. It was much better than I expected. I’ve had bad experiences with the Studio Ghibli dubs in the past, which seem good on paper with known actors in the cast, but the English language tracks always seem odd and off-putting. I think that might be down to Japanese having such a different rhythm to English though, whereas French has much more in common with it. The film looks lovely too. 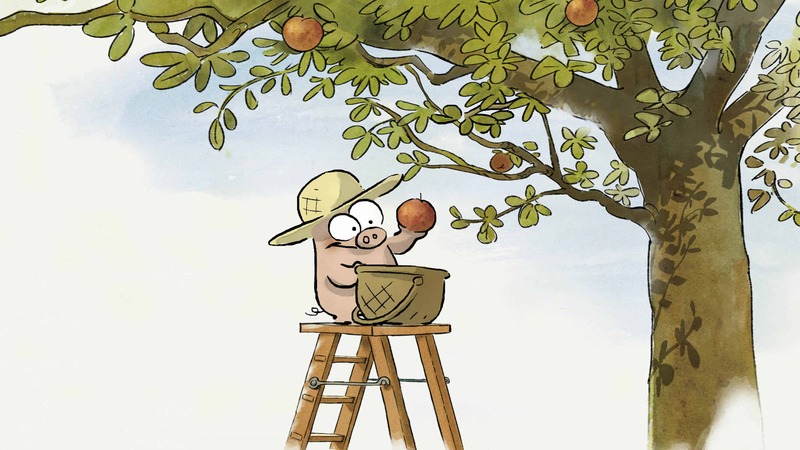 Like Renner’s previous film, the wonderful Ernest & Celestine (which he directed alongside Stéphane Aubier and Vincent Patar), it’s painted in a simple watercolour(ish) style, similar to that of a children’s book. It all certainly went down well with my girls. My eldest, who was traumatised by the far-too-aggressive Peter Rabbit abomination earlier in the year (“I never ever want to watch that film ever again”) was delighted by The Big Bad Fox. I asked her what she thought about it and her response was a simple “good good good” and “it was a little bit funny”. My youngest, who is only 2, seemed to enjoy it too and she often struggles to sit through anything longer than half an hour. All in all, it’s lovable, innocent fun. It hardly breaks the mould and those looking for an animated film with more meat on its bones might be disappointed. However, I found it refreshing to watch a truly child-friendly film that doesn’t try to aim for too broad or inappropriate an audience and isn’t laden with schmaltz or hammered home messages. It’s a charming watch and one I imagine my kids (and I) will be more than happy to revisit. The Big Bad Fox and Other Tales is out on 26th November on DVD and digital download in the UK, released by Studiocanal. I saw the DVD version and the film looks and sounds great – the picture looked clear and crisp on my projector, despite not being HD. The only features are the option to watch the film either in its original French language or the English Dub and a ‘Making Of’ featurette.